SYDNEY (AP) — A top Australian official seized Friday on past comments from Malaysia’s prime minister seen as anti-Semitic, amid a diplomatic war of words over the possibility of Canberra moving its embassy in Israel to Jerusalem. 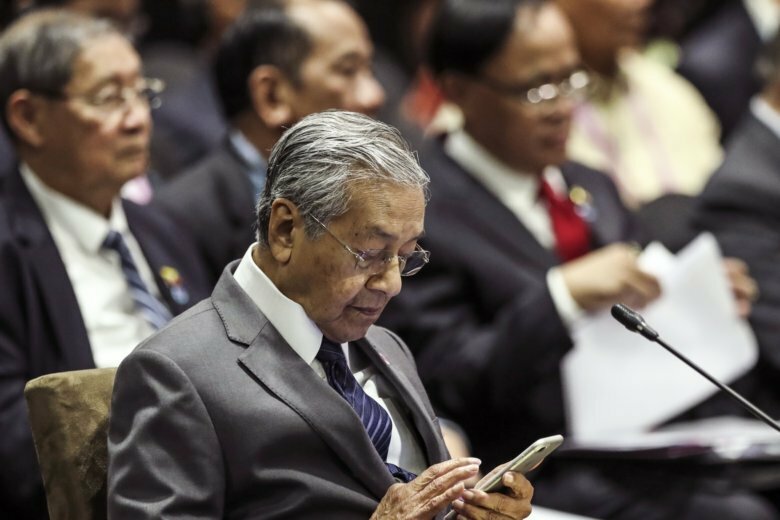 Malaysian Prime Minister Mahathir Mohamad raised the potential embassy switch in a meeting with Australian counterpart Scott Morrison in Singapore on Thursday, later telling reporters such a move could increase the threat of terrorism. Australian Treasurer Josh Frydenberg responded Friday, saying Canberra would make its own decisions. Frydenberg, the son of a Holocaust survivor, also pointed out past comments that the leader of Muslim-majority Malaysia has made about Jewish people. “He has called Jews ‘hooked-nosed people.’ He has questioned the number of people that have been killed in the Holocaust. He banned ‘Schindler’s List’ as a movie being shown,” Frydenberg told reporters in Melbourne. “They are hook-nosed. Many people called the Malays fat-nosed. We didn’t object,” he told the BBC. Mahathir also challenged historical accounts that 6 million Jews were killed in the Holocaust, saying the figure was 4 million. In 1994, “Schindler’s List” became one of many films banned in Malaysia during Mahathir’s previous time as prime minister, with the country’s film board rejecting it as Zionist propaganda. Australia’s indication that it may follow the United States’ contentious move of relocating its embassy to Jerusalem from Tel Aviv was seen by many Australians as a political stunt. Critics called it a cynical attempt to win votes in a by-election last month for a Sydney seat with a high Jewish population. But on Friday, Frydenberg insisted shifting the embassy made sense, although it has also inflamed tensions with Australia’s closest neighbor, Muslim-majority Indonesia. “Australia already recognizes Israel’s sovereignty over West Jerusalem. It’s where the Israeli Parliament is. It’s where the Australian ambassador presents his or her credentials. It will be the capital of Israel under any two-state solution,” Frydenberg said. Morrison said Friday that a decision on the embassy would be made by Christmas, but rejected fears the plan had caused collateral damage by placing in jeopardy a proposed free trade agreement with Indonesia. “I do not conflate the issues,” Morrison told Australian Broadcasting Corp. radio. Indonesian opposition politician Dian Islamiati Fatwa also warned this week that Australia moving its embassy may provoke Islamic radicals in his country.